Face-to-face conversation is a common and important way we communicate. Conversations can be difficult for the 3 million people in the U.S. alone that have a disorder preventing speech. People who cannot speak may use an Augmentative and Alternative Communication (AAC) device. Reflecting the broad range of abilities of AAC users, a similarly broad range of AAC solutions exist, from simple communication boards to sophisticated tablet computers. For literate AAC users, a device that makes predictions based on the redundancies inherent in natural language is often used. Unfortunately, entry rates for predictive AAC devices are typically slow, often below 10 words-per-minute. 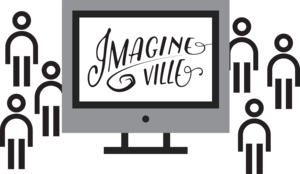 ImagineVille is an online community whose goal is to create dialogue data for improving predictive AAC. This will be done by having ImagineVille volunteers engage in real-time conversations. For example, two people might have a conversation in which one speaks while the other responds using an interface that only allows slow typing. This allows us to collect unique types of data we need to build better predictive AAC interfaces. It will also provide a place for people to practice speaking with someone having a fundamentally different communication rate. We hope users of AAC input technologies in particular will take part in the community. We are in the process of building ImagineVille. If you're interested in helping once we are up and running, fill out the form below. We'll send you an email as soon as the first version is ready. Thanks for your interest!